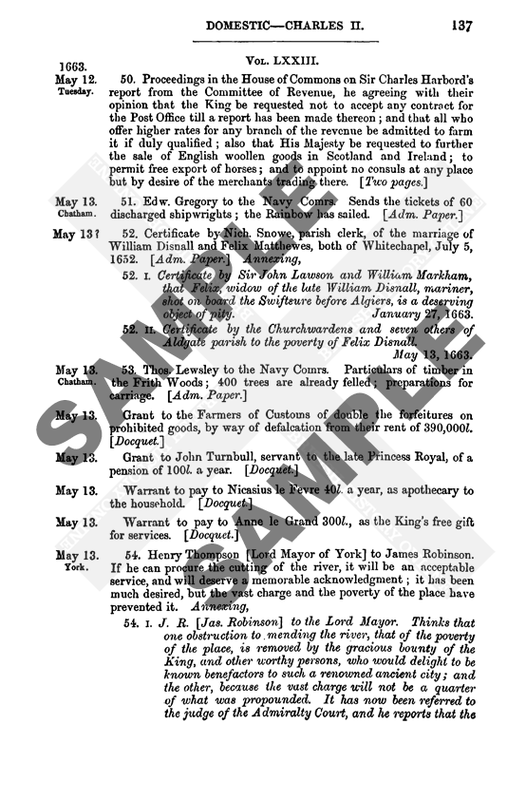 Calendar of State Papers Foreign: Elizabeth, Volume 16, May-December 1582. Originally published by His Majesty's Stationery Office, London, 1909. I have era now written to you on behalf of certain French merchants who have a matter on hand touching some sureties, in regard to which they have been and still are at law, and their cannons (?) every day molested and pulled about (travaillés), although the case is not decided, and the Judge of the Admiralty has [sic] reported to the Council according to the commission received by him. This is the reason why I again beg you on behalf of those merchants to write a word to Aldermen Barnes (?) as the bearer of this desires, and as you will recognise to be reasonable, in order cannons may not be thus molested, and they may have a little more relaxation than they have hitherto had; and that Suigo who is the author of the action and prosecutor therein may be more reasonable than he is at present, for which the merchants will be much obliged to you.—London, 13 October 1582. P. S.—(in Mauvissière's own hand, the above being in that of a clerk). Since Baiamonte is the bearer of this, I thought it well by the same opportunity to bid him take and present to you a memorial sent me by M. de Foix, my master's ambassador at Rome, with the request that I would lay it before her Majesty and the Council as a matter which he deems of great use and necessity to the public weal of all England; which is what has made him, as he writes me, address this memorial to me, remembering as he ever does the honour and favour which he received here. He further writes me that he would fain requite it on some good occasion; and begs me to answer him promptly, that he may keep the person who gave him the memorial to transmit here in a good mind, as soon as her Majesty and the Council find it acceptable. Please say something about it to Baiamonte, who will speak of it to the Lord Treasurer. It is understood that an ambassador has arrived in England, sent from the Duke of Moscovia, to whom, if you please, it might be made known in what sort his duke's ambassador has been used in Venice and Rome, and how the Pope only seeks the duke's acquaintance for his perdition there is sufficient cause to judge. The ambassador now in England would upon the notice of this advertise his duke, considering with how great indignity the Jesuit Padre Possevino at Venice lately withdrew almost violently in public show the Muscovite ambassador, when he with his little number were ready to enter the Greek church in Venice to pray to God after the form of their duke's exercise of religion, and with reproach caused him to return from the Greek church; which act has given great cause of obloquy, and made the Muscovite ambassador to be despised. Moreover it is understood the Pope entertains the Muscovite and has caused him to send an ambassador to Rome only to put a jealousy between the Turk and him, whereby there might arise a war; not caring whether of these were overcome, so they might fight and continue in arms while the Pope meantime may get leisure to advance his and the Spanish king's dignity in other places of Christendom. They further advertise how the Pope seeks to bring the Muscovite into a double servitude: first to himself in such sort that he must 'acknowledge of him his new faith and induction into the Papal Church,' through which the Pope is to make a great party and faction within the Muscovite States, because the prelacy will take their donations of all their bishoprics and benefices from the Pope. Besides the Pope intends to entangle the Muscovite in certain confederations with the Emperor against the Turk and Poland, for the emperor doubts the King of Poland will demand certain 'holds' on the frontiers of Hungary. Thus much being 'informed' the Muscovite ambassador, he may thereby be moved justly for the service of his duke to advertise it, whereby the Muscovite might be advised before he is thus entrapped in the Papal servitude and treasons, which not prevented may prove prejudicial to himself and to other princes. And so it may thus the rather be hoped that he being by better means instructed in the clear religion of the 'Evangile' will the willinglier hearken to it. I have been moved to 'remember' thus much to you upon the desire I have the dominions of the Muscovite, though they be remote, should be instructed in the true exercise of God's religion; remembering withal how it might become noisome to our merchants if the Pope's power should in any sort be stretched forth to those parts, which my little care herein I beseech you may not be misliked.—Paris, 13 October 1582. I have had brought to my hands this packet, the cover of which was opened, and because I saw the letters had the direction you may see, I would leave the opening of it to you, with opinion they contained matter 'feete' to be first discovered in England, for the better service of her Majesty, notwithstanding by the directions and the seals I have cause to think the French ambassador in England deals much the favour of the Scottish affairs, as I surmise other French ministers who serve about her Majesty do the like. I send herewith another packet directed to M. Marchaumont; it may be, if it be as I hear, that he has letters in favour of d'Aubigny, in whose cause I hear he will deal with her Majesty. Thus those Scottish practices are handled as stumbling-blocks to be cast in the way, 'for the impeaching of the marching to the settling in Scotland of God's word and will,' and to overthwart her Majesty's establishing of her further repose and strength. The example of uniting Portugal to Castile was found necessary to King Philip; what Scotland may seem to her Majesty, God knows. Methinks the Scots may see how unprofitable the pensions of France are to them, and that they are used but to serve a turn, but her Majesty's graces are more natural; the favours received from England have been to better purpose than the French. And their uniting of themselves with England will be to their great profit and comfort, which God send it, to her Majesty's contentation and perpetual glory.—Paris, 13 October 1582. The good affection which you have always borne to soldiers and men professing arms, emboldens me at present to commend to you the bearers hereof, Captain Prise and Captain Huntley, who for some private causes of their own are making a short journey into England. They are captains of my own regiment, and by their service have often made good proof of their sufficiency and 'valew'; and withal being of honest conversation, and always well-affected to me, my trust is they will be the better welcome. I beseech you to receive them favourably, and wherein they shall be driven to crave your countenance and aid during their 'small abode,' please assist them with it, so that they may find this my commendations to you to have stood them in stead. Touching anything from hence, besides the late arrival here of the Prince of Chimay with his lady, and some small number of the French, who are busied in taking the castle of 'Eccove,' not far from Malines, there falls out nothing worth the advertising.—Antwerp, 13 October 1582. (Signed) J. Norreys. My last was written at Middelburg almost 14 days ago, but through lack of wind and good passage lay long at Flushing and I doubt is not yet come to your hands, for we fear the loss of the ship, wherein the post, with some 'other' young merchants of our Company, went to sea on the 5th inst. My letter was of small importance but to give yet another reason of the Dutchmen's small shipping from Antwerp besides that your careat might occasion; viz. since the loss of Lierre neither this town's men nor 'other' foreign merchants venture to bring any quantity of goods to this town except such as they know to be in effect sold beforehand, but detain and dispose of their goods at Cologne, Wesel, Dort and elsewhere. Besides, these men have cunning enough to ship their goods at other ports of this country than at Antwerp, and to consign them to ports in England other than London; which on this side will hardly be 'tried' or found out. And for 'colouring' their goods by any of our, I hardly think that would be, for men will be loath to carry another man's goods to the market, whereby the good sale of their own should be hindered; so that in truth I know not how her Majesty will get contentment by arrest unless some of them resident in London should be touched for it. But I rather wish it might be otherwise satisfied. This evening Paul Auradt sent me in writing certain words whereof please peruse the copy enclosed. Our merchants have agreed with the town of Middelburg for keeping the traffic there; which so stirs those of Antwerp that they have moved the duke not only to write, as it is said, to her Majesty for our stay, but to demand of us the reasons why we will go from Antwerp. These are easily given, for we have here neither convenient sale of our goods, nor good wares to make return; so that if we continue trafficking as for almost these 12 months we have done in Antwerp, it would not only pinch our merchants shrewdly, but also be greatly hurtful to our common wealth, as I know you much better judge and therefore I crave pardon. Mr. Gilpin is not yet come from Augsburg. It is said that a hard decree has there been passed at the Diet, but my late coming from Middelburg does not permit me yet to know the certainty nor effect of it. But by Mr. Herle, who departs for England with this post, you may know of it, if any such be. I have lent him 5l. ft. And now Stephen Lesieur being come from Cologne desires me to furnish him with 100 guilders for his provision into England; wherein for want of your commission I know not what I may do, and in not doing it, some inconvenience may grow. So if I can furnish him, I mean to do it. Wherewith, not having else, I take my leave.—Antwerp, 13 October 1582. Hither has lately come the Prince of Chimay, son and heir of the Duke of Aerschot, with his family, and has been kindly received by his Highness and his Excellency, who went to meet him as far as the Bivon (? ), the place of disembarkation, and accompanied him to his lodgings, and so likewise before the magistrates of Antwerp. Please God he may remain constant, as is hoped, in the good cause, and of the Religion, which he embraced, they say, through the means of his wife. The States' people, or rather his Highness's, are at present upon some enterprise in Brabant; and it is already said that we have taken a castle called 'Ecouen,' near a river and not far from Malines. The rest will be known as days go on. I am told that the Elector of Cologne has announced a Provincial Diet in his State, where the nobles and estates under his dominion are to meet on various business, and specially on the question of religion. I commend myself to you and Mr. Robert Beale.—Antwerp, 13 Oct. 1582. Mr. Norris and I have, according to your direction, chosen two gentlemen to hear and end the matter in controversy between us. He has chosen Mr. Knollys, and I Mr. Yorke. Mr. Norris refuses to be bound to stand to their award, and therefore they have done nothing but talked of the matter, nor mean to do, so far as I can perceive. I have offered to show Mr. Norris all my writings, whereby I claim that that money, but he refuses to see them, alleging that none could decide the matter but the Prince and the Estates. The Treasurer of the Wars was appointed, by a warrant from the Prince and the Estates, to pay Mr. Norris all the money due for the 11 ensigns, of which my 3 were parcel. Mr. Norris has paid the 8 companies all their by a prime contract, as he says, between the Prince and him; which is unlikely, because the Prince never meddles with the Estates' money. So I am forced, if I would have my right, to know by petition what has passed privily between the Prince and him. He says that rather than I should have the money which remains in his hands for my 'dead pays,' he will deliver it back to the Estates on his account and reckoning. By this you may easily judge how he deals with me. The news here are but small. The Frenchmen went out two days since and took two castles, one called 'Eccoe' the other 'Duffill,' from the enemy. They stand upon the river of Lierre. The Englishmen lie at 'Burganhoth' still, and will remove to no service until they have their pay. the French have encamped near 'Macklin. '—Antwerp, 14 October 1582. My last was the 7th inst. since which the magistrates have received as follows. The Prince of Parma at his being beside Lille and those parts made great provision of all manner of victuals and specially of grain; for by good advice this week from Lille, his meaning was to have lain all this winter in those parts and to have laid siege to Meenen or Ypres. So they write from sundry places his sudden departure must greatly import him, because he has lost such 'commodity' of time as he will not again get in those parts in long time ; for it seems by their writing he had those parts at a great advantage. Since the Prince of Parma's departure from those parts, those of Meenen began to be very busy with them of the new 'bulwark' of Hallewyn; for which cause he has sent them for their better aid a regiment of 10 ensigns of foot and 5 cornets of horse. Also the Prince of Parma sent to St Omer's Aire, and Lille to take in Spaniards to lie in their towns but for this winter; and to this the governors of the towns were willing to yield at his desire. But the burghers and soldiers will not yield to it, and so with most humble suit they have desired the prince not to trouble them with any, for they will have none. Which answer he takes in very evil part, and specially against those of Lille, in whom his whole trust was that they would not refuse him. The Scotch companies that lay at Dunkirk by command from Monsieur, have departed thence and are sent into Brabant, greatly to the discontent of the Four Members of Flanders, for they had rather have kept the Scots than the French in their town. The Prince of Parma with some of his camp, lies within four leagues of Brussels, and the rest lie scattering beside Douay, where it is thought they cannot tarry long because victuals and forage are very scarce there. They also write from Lille that Monsieur's forces from France have passed the Somme. But they write they are not so many in number as at first was reported; which seems to be so, for by good report the Prince of Parma is not afraid of their coming. The Prince of Épinoy is this week come to this town, to get the good wills and consents of Bruges and the 'Free' 'to be governor' of Flanders, for those of Ghent have granted him that good will 'in this order'; they have named three, of whom he is one, and the others are the Prince of Orange and Count William, one of Count John's sons. So the Four Members of Flanders must give their answers herein particularly, as they shall think good, and Monsieur and the Prince of Orange have written them greatly in favour of Epinoy. But for all that, I understand that Bruges, the 'Free' and Ypres will hardly yield to it, because they say it will be a great charge to the country and little service; and besides he is a great favourer of the Catholic religion.—Bruges, 14 October 1582. Since my last of the 7th inst. nothing has been done by the forces left in Guelderland, but expectation and good hope that they will be able ere long to recover some of the castles there from the enemy, who is said to be in a manner wholly retired out of those parts towards some part of Brabant. The States of Guelders and Friesland have insisted to have Mr. Norris remain among them, alleging Count William to be too young and altogether disliking Count Hollock. But the enemy having retired thence, and his Highness being desirous, as he says, to have Mr. Norris remain near about him, I cannot have any hope he will be employed in those parts. He is at present greatly in favour with Monsieur to all outward seeming: greatly made of, since his coming from Lochem, by his Highness and all his. A day or two ago, he told the general that he would sup with him as this Sunday night; which will be performed, and already good provision is made for his reception. I hope this good beginning betokens some better usage towards our English troops; whereof they have great need, being in such hard plight, and no order taken for their relief, notwithstanding Mr. Norris has most earnestly solicited their cause, and receives so good answer from his Highness that it would indeed seem he pitied their extremity, and had great care to relieve it. Our English companies, being lately called on to go to some piece of service with the French, refused flatly to stir one foot before order given for their pay; whereupon the French only went to the service of the castle of Ecchove, which was surrendered to them on the 13th by composition. Their forces remain still about Malines, to be employed, as it is thought in some other enterprise in those parts. Two English companies, which have remained a while in garrison at Alst, have lately been drawn out from thence and sent to the camp, and so have the four companies of Scots in the town of Dunkirk, and that place is now wholly kept by French and Walloons. M. de Chamois, whose regiment is at Dunkirk, has so prevailed there that M. 'Turlon,' the governor, has no 'devotion' to return to that charge, but follows altogether the Prince of Orange ; and so also divers other gentlemen of this country, not without some show of discontentment with the French. This morning the rumour is secretly in the Court that the French companies employed for the taking of 'Ecchove' were yesterday, since the taking of it, defeated by the enemy not far from Malines. There is some likelihood that this report may prove true, though as yet I am not able to learn the certainty. By the first convenient messenger I will advertise you of it, and the particulars. It the news prove true, it may be his Highness will not stir abroad tonight, and then Mr Norris's provision will be in hazard to be left. Please excuse me that I make an end before I am well advised whether any thing else remain to be advertised. His Highness's coming puts us to some trouble, being not wonted to provide for such guests.—Antwerp, 14 October 1582. This day I received a letter from a friend of mine in Flanders, which 'is borne' in the Isle of Tercera. He tells me he has received a letter from thence, date the 17th Of September. The news are, that they are too strong for the Spaniards all this winter. The Frenchmen came there full of sickness, and are sick still, and have infected likewise the people of the country, and 10 or 11 of them die every day. Those who are in health are settled in honest men's houses, who are very sore troubled with them: and they abuse their wives and children, and they had leave to spoil the houses of those who took King Philip's part, 'and were' fled into the woods and took about 15 gentlemen's wives to them and carried with them prisoners to the sea, and there 'were' like to be abused by the Frenchmen, and with much ado saved their honesty, and so by the means of some honest men who spoke in their behalf to the King, they were brought ashore again, and are kept all together in a house as prisoners. What will become of them no man can tell. They lack corn, wine, and oil; as for money there is none but such as Don Antonio has 'quinead' [coined], that is to say, the silver money with two third parts of brass and the third in silver, the gold with two-thirds copper and one gold. There was a 'coolidge of Jessuesyts,' which was made a hospital for the sick, and the Jesuits were carried aboard of a ship which has neither mast nor sails and with a rotten cable, ready to be broken with the first storm, and after this sort they will sink them, because they took always King Philip's part. By the King's command a strait enquiry is made of their substance and debts, and he has taken almost all from them. And there was a vineyard digged, and a great 'substance' found of money and gold and household stuff, and all was forfeited to the King, and likewise the vineyard 'forfeit for' the king, and sold by-and-by by proclamation. And this is the poor estate of the poor island and the inhabiters thereof.— 14 October 1582. P.S.—Robert Smythe was here with me, and he told me he was with you, and you 'would have to talk' with me. 'And' he could agree with me, you would be glad to deal with us both. I answered him that if the 'overplushe' that he demands were commodious for us both, I would be content to deal with him and I desired him to show me what it was, and so I promised him I would never 'step in his suit.' And so he showed me his demand, which in my opinion 'there' is great folly, for he desires that he may dress within the realm the said pelts and transport them over, paying treble custom. And I told him that he brings himself into great inconvenience, for he offers to be at treble charge for the transporting, and other men pay single custom for it; for it is lawful for every man to convey them ready dressed, paying ordinary custom. Bu if he could bear the other men to transport them, either dressed or undressed, that were somewhat; but it is a thing against all reason because many poor men live by it. Therefore it is not to be demanded, 'and for to be granted,' yet I promised him for his satisfaction to go ask counsel in it. And so I have, and I was with Mr. Owen, and he told me just 'and' I have said. But I perceive the said Smythe is a busy fellow, for yesterday he was with Customer Smythe to entreat me in his behalf, and I answered him as I have said before; and with that he was satisfied, saying that I had a good cause to crave some recompense at her Majesty's hands for my losses. He was also with 'Androus Deslowe,' and he demanded what he would give for the reversion of his license, and he offered him £300 for it, and no more, saying that the troubles in Flanders altogether hinder the dealing in it. Therefore I beseech you stand my friend in it as you have been, and if it be my fortune to have it, that I may have 10 or 12 years in it ; for in that space I hope that either I or my heirs will be 'restored to' my losses. And forasmuch as you know my lady 'Susicks' has been my good lady in this matter, I thought it good to advertise her the state of it, and she 'takes on' very much in it, saying that it is her honesty and credit lost if another man should 'step in her suit.' And she sent me word that she would send her steward to Smythe, and she swore to the messenger that if she were near her Majesty, she would 'bagge' (qy. beg) the same herself, rather than trouble any man more in it.—From my house, 15 October 1582. Ever since the receipt of your letters, I have been with the General in Guelderland at the raising of the siege before Lochem, a long and tedious journey; I hope a sufficient excuse for my long silence. And since I doubt not but that you are already sufficiently informed touching the particulars of that enterprise, I spare to write of it at large; assuring only thus much, that if any man whatsoever list to challenge to himself, by his own policy or 'valeure' to have been the cause of the enemy's rising from thence, surely any such but utters his own vain-glorious humour thereby, neither shall he deserve at any time hereafter such an extraordinary favour at God's hands. Some informers of their own fancies from hence allege that a mutiny amongst themselves was the occasion of their sudden departure, but since that time we find for a certainty the contrary of that. Some, seeking rather to be the first than the truest advertisers, have both said and written that the soldiers within the town, by making a desperate sally upon one of the enemy's sconces and winning it, drove such a discouragement into them that thereupon they raised their siege. This report is likewise untrue; they of the town indeed sallied out in our presence, but they suddenly retired in again a speedier pace than they came out, and of seven captains that came forth, six returned sore wounded, some to death. The likeliest conjecture that I can gather of their dislodging, was a rumour spread among themselves that General Norris with all his regiment was arrived against them, and that the rest of our forces was treble 'to' what it was indeed. A confirmation to that conceit of theirs was this: the next morning after our arrival before the town, having only a little river between us and the enemy, our general—without whose direction our chief leaders, Count William of Nassau and Count Hollosk his assistant, would determine nothing, although his own regiment were not there, saving only his 3 companies of cavalry—by break of day set all our forces in such an order of battle that they seemed to the enemy treble 'to' what they were indeed. This probable conjecture we may please ourselves withal; but in truth God gave them faint hearts without any cause ministered to them by us, for in two days skirmishing with them, we rather 'lived by the loss'; the town was not able to hold out three days longer; they left more victuals in their camp than we had in ours to live with; their number was above 6,000 foot, whereof 2,500 armed pikes, and 900 horse—ours did not exceed 3,000 foot and 1,400 horse; they marched away orderly, like soldiers, sending all their baggage before them, without leaving so much as one wounded or sick man behind. Besides that, they stood in order of battle the day of their departure, before they began to march away, almost until noon, like challengers against all defendants; but we were not hasty to hinder their passage. The town itself, but of small importance and less force; the enemy never laid any batteringpiece against it, but 'enforced' it by famine. It was relieved only for their sakes that were in it, as three young brothers, Counts of Bergen, nephews to the Prince of Orange, and to the number of 1,500 captains and soldiers that had 'recovered' the town for their safety at their late overthrow. From thence we returned into Brabant, where we find our poor people, for want of pay or victuals, in pitiful plight, consumed almost to nothing, in 32 'ancients' scarce so many score men, and likely to diminish before they increase; little regarded by 'these country men' but when they serve like drudges, and most disorderly persons if they be never so little pampered. At present they refuse to serve without a pay; the officers ready to give over their charge, the soldiers careless what becomes of themselves; in truth neither of them that acknowledge themselves to be bound to their country for anything but their birth—a weak bond to their lawless necessity. Unless God give them greater grace than such people are commonly 'indewed' with, I find them almost all in one predicament, and excepting some few, the rest in my conscience 'lease' nothing by the bargain if they may purchase Jacob's pottage for all their patrimony. The better sort of them stick not to say that they have nothing to lose in England, nor any gain here but what they get of him that will give most. Yet I know that divers of them are there taken for gold by their 'glystering,' and here tried to be but copper by their 'twitch.' They count honesty a heretic, and true dealing a schismatic against their profession; they show no care of religion; in one word. they are all hirelings; and therefore I doubt not but that you accordingly consider of all reports that come from hence, not what they are, but from whom they come. Our general in my opinion lives in most miserable case of all others, but that God has bestowed on him an extraordinary patience to conquer all passions; for among all his followers he has no one assuredly to trust to, but, if he be willing, he wants wisdom, and if he wit, he lacks honesty. In time of their necessity they fawn upon him humbly, and when their turn is served they frown upon him arrogantly. They all can do nothing without him, and yet they envy 'at' his honour. To the Estates he is tedious in suing to relieve his companies, and of his ungrateful troops he is daily slandered for not doing more for them than he may. He is forced to forbear of executing discipline duty, for he may not in equity punish sharply whom he cannot pay truly. I am not able to set down the hundredth part of the crosses that he suffers daily, yet seems not to feel them; neither can I do less in my conscience for my country than heartily to pray that such a man be not suffered to be drowned in so unworthy a place and company. Fresh rumours are daily raised of the coming of great troops from France: but while the grass grows, the horse starves. The condition of 'these country men' is strange; for they are miserable and yet glorious, fantastical and irresolute in their own proceedings: craving help of all men, yet rusting no man; neither can I blame them much 'to be' jealous of their own estate. I cannot term them better than a confusion of conceits. If their French helpers come in too slow, their turn is not served: then they renounce Alteza and all his race. If too fast (which yet I see no cause to fear), they say that they have but changed a point on the tables with the Spaniard. In either of these extremities they resolve that there is no remedy but out of England; yet had they rather lose one of their own eyes, than that we should see with both. Yet surely, unless my eyesight dazzle in levelling at so high a mark, her Majesty may at leisure advise of the matter, or write: Cui faveo rincit: or if she list, be her own carver. But if it please her still to hold the balance in such sort as she has done, yet is it wished that her own men might eat her own money; for to the Spaniard the lending of men or money is all one, and to her Majesty it is far better [Sic]. So—to cast a fool's bolt quickly —either spare money until a dear year, or else spend it to some good purpose. Pardon my sauciness for writing thus plainly. The dutiful service that I owe you, for your honourable courtesies daily bestowed on me, and my due observation of all dealings in these parts, encourage me to write what I know to be true. His Highness is but hardly 'kept twytche withal' with this currish kind of people; yet certainly he omits no honourable means that may be to gain their good wills. I see the world almost become Malcontent. Myself in best plight, for I have least to care for here, but in worst case when I consider the unfortunate cause of my coming hither. At my first arrival here, when I proffered my service to his Highness, he seemed not to be ignorant that her Majesty's displeasure conceived against me by the sinister solicitations of the Spanish ambassador was cause of my coming over; which considered, together with my race, as he says, and my 'chargeable' serving of him with men and horses at my own cost, he could not do less than thankfully accept of my service and also procure by all means he might get her Majesty's favour for me again. I confess that I was very glad to hear his honourable offer, and acknowledge myself worthy to be condemned by all men, if I would not seek her good grace by every good mean; yet certainly, fearing her further disfavour, I was fully determined to forbear this manner of doing myself good and rather choose to smother myself in the smoke of my own 'Melancholyke' than once take breath abroad by revealing my disgrace at home, unless himself had first broken the matter to me, with promise to prosecute it in my behalf. God knows how greatly I gape for some good fruit of his labour and my travail. Whereunto I beseech you to put to your helping hand. I understand from his Highness that Don Benardino is 'upon departure' out of England. All her Majesty's displeasure go with him; I can wish him no greater plague, if he esteems her favour as I do. I beseech you that by this bearer I may hear from you, and know some certainty of her Majesty's opinion towards me, that I may dispose of the rest of my life thereafter. I live at great charge, which I am not able to continue long. Without hopes of her favour I am resolved rather to serve the Turk than to return to England. Upon answer from you, I am determined to set down for myself some 'platt' of 'wearing out' the rest of my life. Our forces are too weak to perform any great matter this winter. The Prince of Parma, with his army, awaits the coming of the French succours upon the frontiers, and, as it is said, has got 'Cambrisaye' without 'a stroke striking.' The enemy daily wins towns and castles of importance from us; our relics of a camp spend our time in recovering small forts and sconces, whereat although there has been no resistance, M. de Rochepot has found the means, it is said, to catch a 'harquebuzado' through his arm. I see him keep his bed, and hear the blow is great; whether it be so or not, at least the excuse will be honourable and reasonable in the face of the world to forsake his office of generalship here before he be forced thereto. Yesterday his Highness did our general the honour to bid himself, the Princes of Orange and Chimay, to supper, with a great many others, with very short warning; yet they had great and honourable entertainment, to his great cost, and their great contentment. All things considered at this present he might very ill [sic; ;qy. well] have spared such a 'flease' [qy fleece].—Antwerp, 15 October 1582.